In this tutorial we'll examine how to create a seamless texture of wooden boards that are held in place by nails. To download, right-click link and select save. Genetica will be used for this tutorial, which can be downloaded here. The creation of this texture involves three overall steps. First, a plain wood texture is created. Next, the wood is converted into a series of boards. 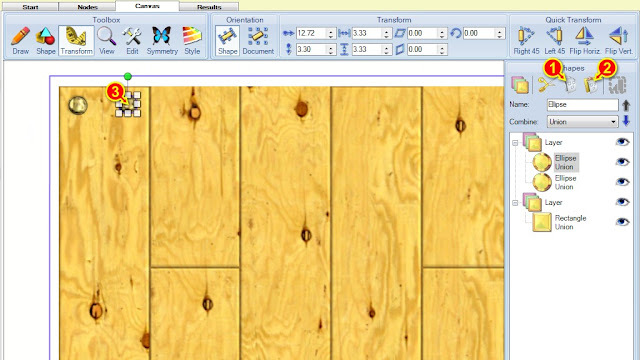 Finally, nails are added at the corners of the boards. Each of these steps will be represented by a node in Genetica. 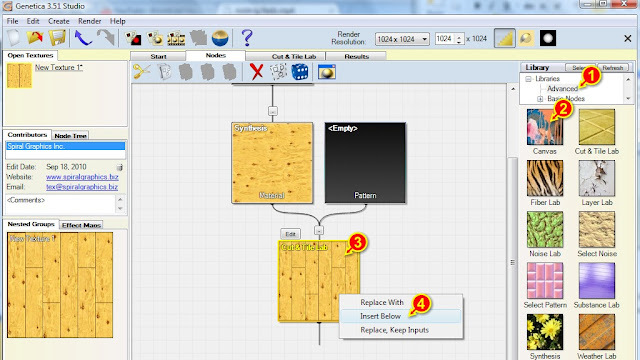 The quickest way to create a plain wood material is with the Synthesis node. 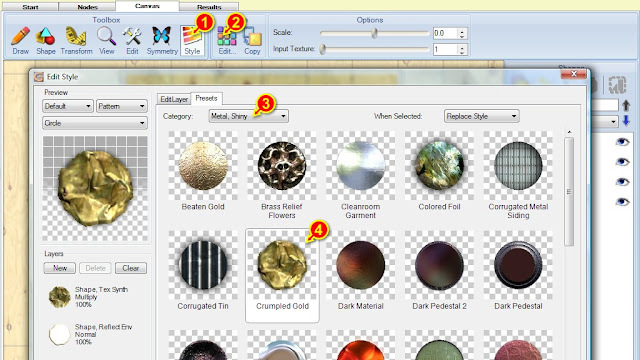 This node can create seamless textures from photographs. 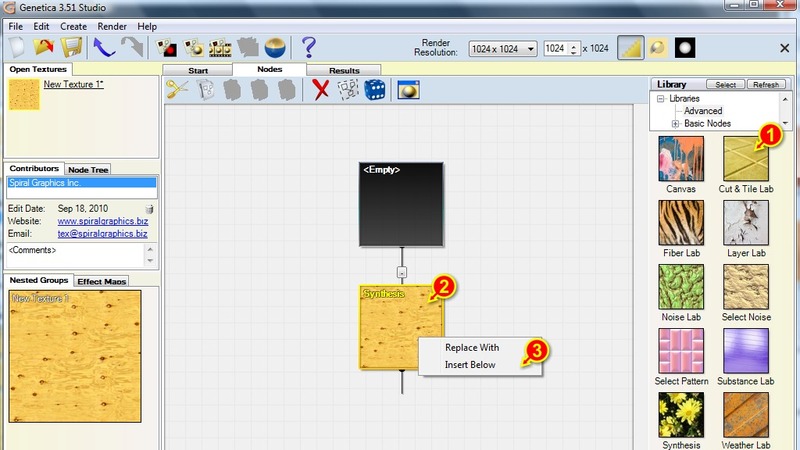 Start a new document (marker 1 in the following illustration), make sure that the Advanced nodes category is selected (marker 2) and drag a Synthesis node (3) into the empty slot in the middle of the workspace (4). Finally, double-click the newly-created Synthesis node that should now appear in the middle of the workspace in order to open its options window. The Texture Synthesis dialog should appear. 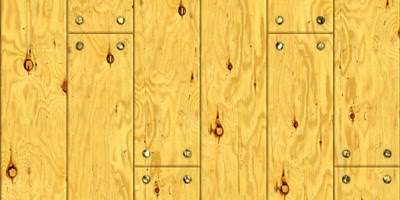 In this area we could create our own wood texture from scratch. But we'll use one of the presets for expediency. Select the Wood category (1) and then select the Plywood 2 preset (2). Close the dialog either by double-clicking the selected preset, or by clicking OK.
Now that the basic wood material has been created, we want to convert it into boards. 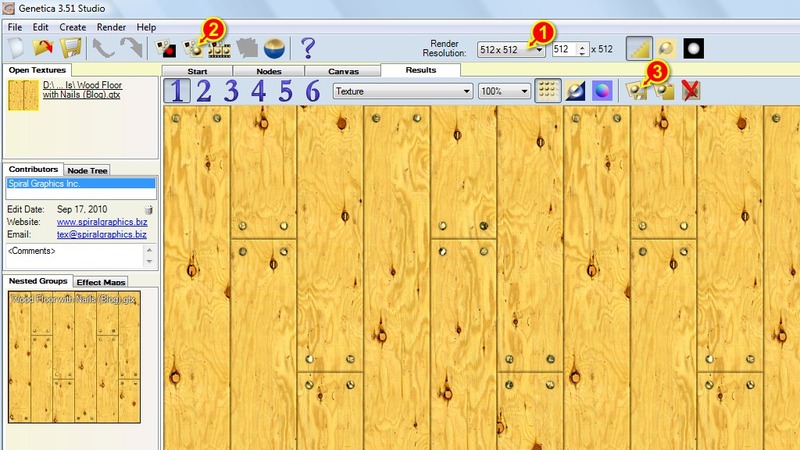 This can be accomplished with the Cut & Tile Lab. 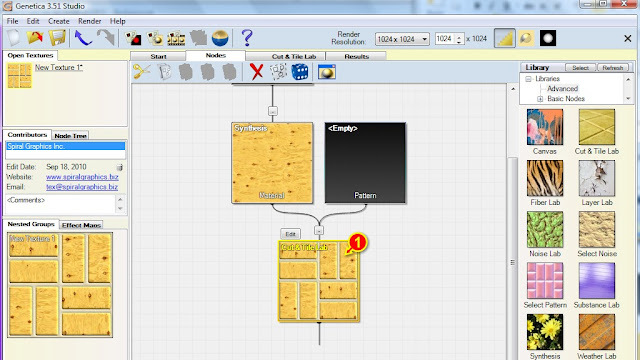 With the Advanced nodes category still selected, drag a Cut & Tile Lab (1) onto our Synthesis node (2). In the menu that will appear, select Insert Below (3). 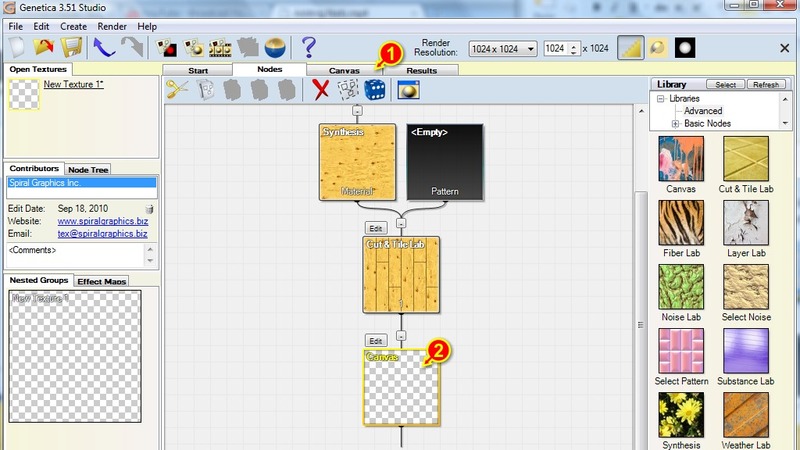 As shown below, this has caused a small pipeline to be created, with a Synthesis node that is creating a wood material, followed by a Cut & Tile Lab that is taking that wood and turning it into a brick pattern. The brick pattern and thick gooey mortar created by the Cut & Tile Lab's default settings aren't appropriate for our texture. 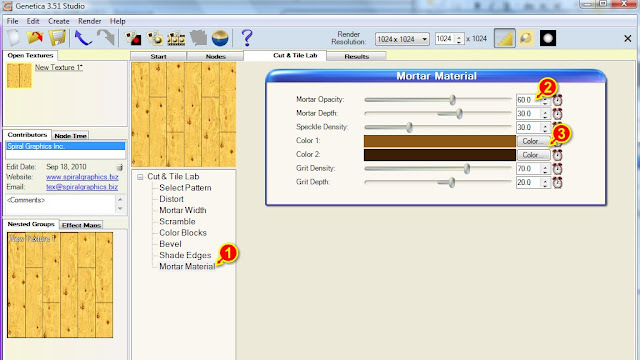 To modify the Cut & Tile Lab, double-click it (1). The Cut & Tile Lab organizes its options into a number of selections. Begin by choosing the Select Pattern section (1). This section reveals the options controlling the overall shape of the brick pattern. 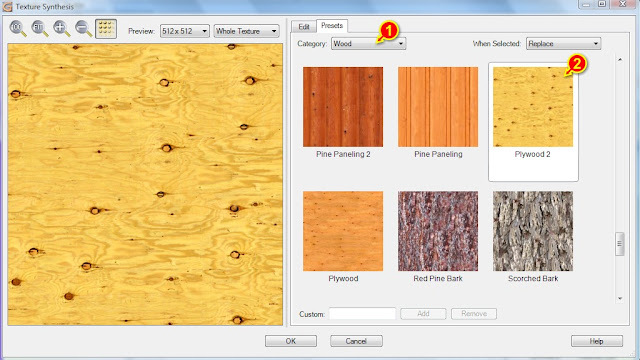 To select a pattern that is more appropriate for our texture, first click the Select Type button (2) and then in the window that pops up, choose the Long Boards pattern type (3). To reduce the width of the thick gooey mortar, select the Mortar Width section and set the mortar Width property to zero. If you need additional help finding this property, or any of the others mentioned in this tutorial, please refer to the video version of this tutorial that was mentioned towards the beginning of this article. To make the direction of the wood grain match the orientation of our boards, select the Scramble section, then set the Material Orientation property to On Side. To make the beveling more appropriate for our texture, select the Bevel section, then set the Width property to 6, the Depth property to 1, and the Curve property to zero. Finally select the Mortar Material section (item 1 in following illustration). Set Mortar Opacity to 60 (item 2) and set both color properties to brown colors (3). The final step is to add nails to our texture, which can be done with the Canvas node. 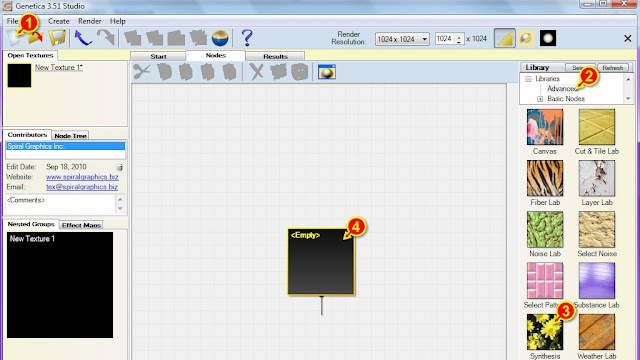 This is the node to use when you wish to either draw a new seamless texture, or to draw on top of an existing one. With the Advanced nodes category still selected (1), drag a Canvas node (2) onto our Cut & Tile Lab (3) and in the menu that pops up select Insert Below (4). As shown below, even though our wood boards are feeding into the Canvas node, the Canvas will begin blank. To correct this, begin by switching to the Canvas tab either by directly selecting the tab (1) or by double-clicking the Canvas node (2). Select the Shape tool (1), the Rectangle shape (2), and then drag from one corner of the workspace (3) to the other in order in order to create a rectangle that covers the entire texture. Our newly created rectangle is filled blue by default, but by changing its style we can fill it with our wood board texture instead. 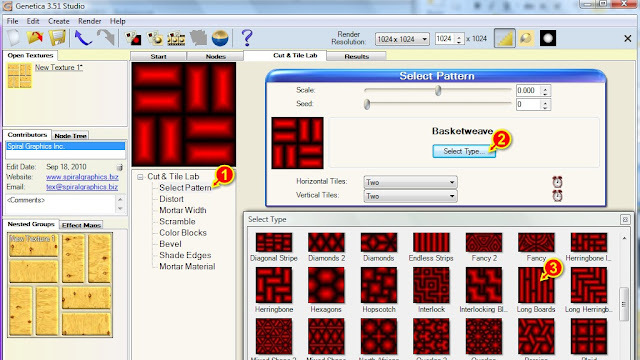 To do so, select the Style tool (1), click the Edit button (2), select the style's layer (3), and set its Effect type to Fill Input Texture (4). Finally, close the dialog by clicking OK.
Now that the Canvas workspace has been filled with our texture, it's time to draw some nails. The nails need to be made out of a different material. In the Canvas node, all shapes in a given layer share the same material, so to begin working with a second material we need to create a new layer by clicking the New Layer button (1). 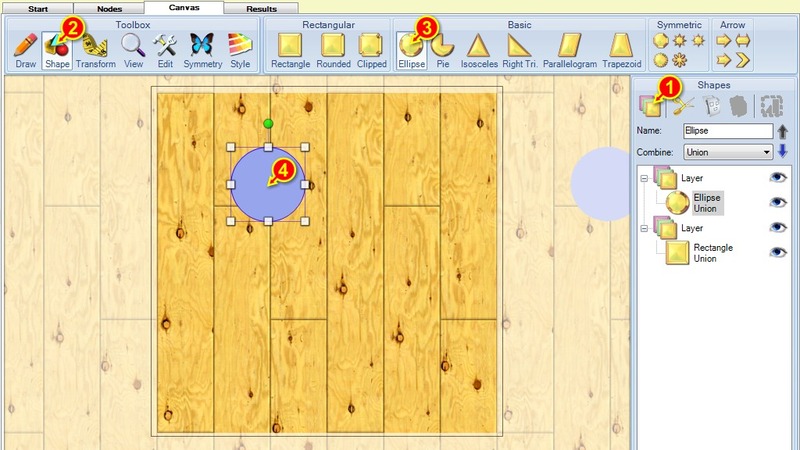 Then, select the Shape tool (2), the Ellipse shape (3), and finally drag in the workspace to create a circle (4). Holding down the Shift key while dragging will constrain the proportions, allowing a perfect circle to be created. As before, we need to modify the style of our newly created layer. Begin by clicking the Style button (1) and the Edit button (2). Next, select the Metal, Shiny preset category (3) and the Crumpled Gold preset (4). Finally, close the dialog by clicking OK. Alternatively, the dialog could have been closed in a single step by double-clicking the selected preset. While the folds and shadow of the selected style will work well for a large shape, they'll be too big for the shape once it has been shrunk down to nail-size. This is because such visual aspects of the style remain the same size regardless of how big the shape is. To fix this, with the Style tool still active, set the Scale property to 4 (item 1). 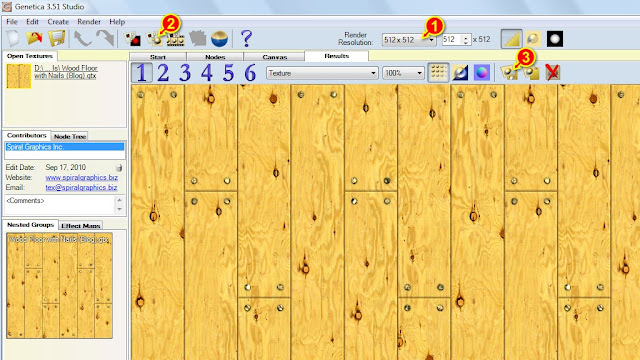 Zoom into the view by using your mouse wheel. 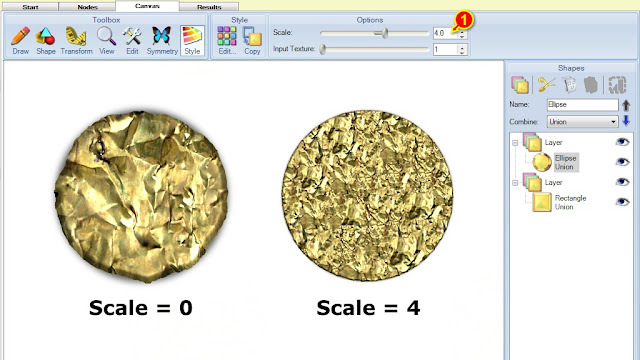 Then select the Transform tool (1). With the circle still selected, drag one of its corner handles (2) in order to reduce it to nail-size. Remember to hold down the Shift key while dragging in order to constrain the shape's proportions and keep it circular. Finally, drag the middle of the shape in order to position the nail (3). 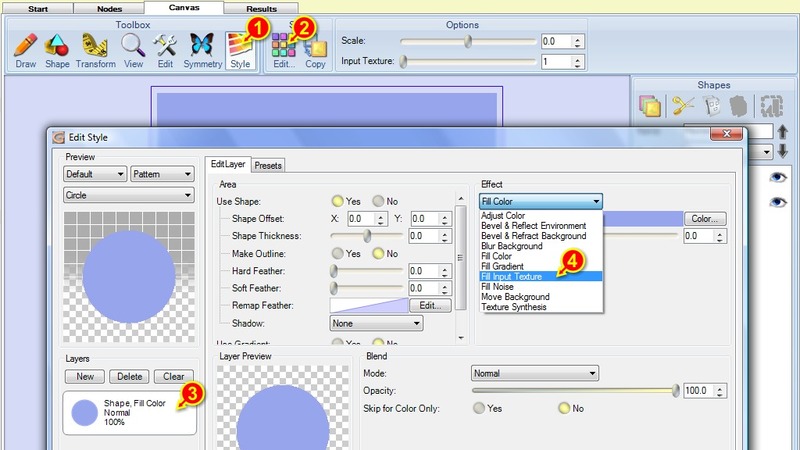 Press the Copy (1) and Paste (2) buttons, or use the Ctrl + C and Ctrl + V hotkeys, to make a duplicate of the shape. Then drag the middle of the shape (3) to place the duplicated nail at the next desired position. Continue performing these actions until a nail has been placed at all four corners of each board. 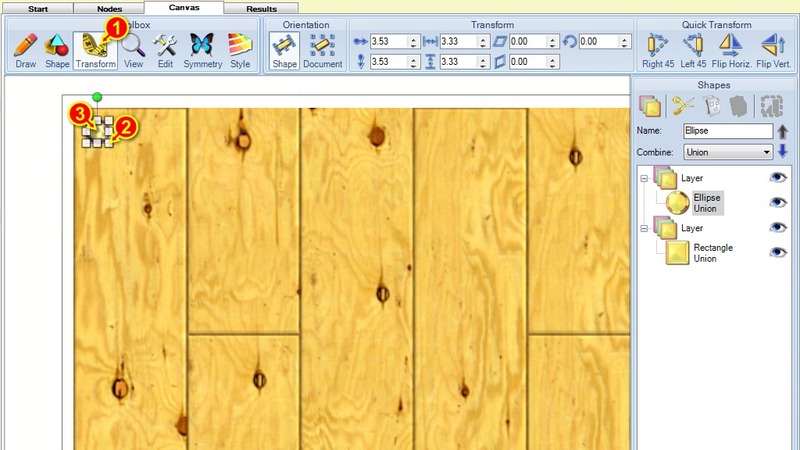 Once finished placing the nails, select your desired render size (1) and press the Render Texture button (2). 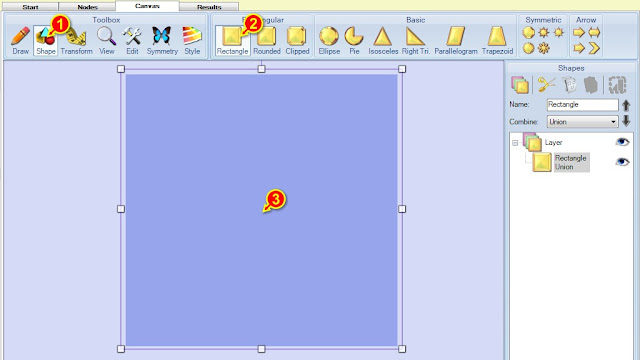 Once rendering is complete, press the Export Image button (3) in order to save the rendered result as a bitmap texture that can be opened for use in other applications.